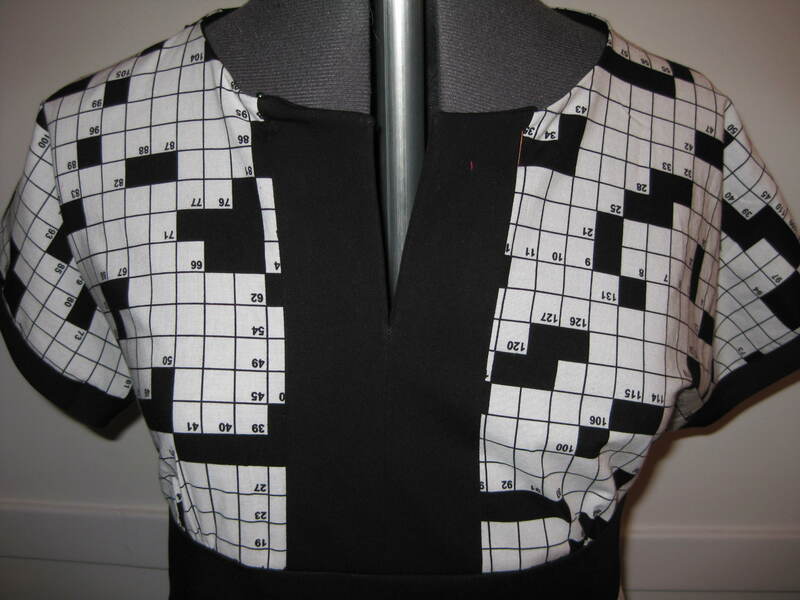 Crossword puzzle stunt dress time! I haven't sewn down the facings yet in this picture, so they're a little lumpy. Can you see what else is wrong with it? No? Yep. I cut the ENTIRE THING OUT UPSIDE DOWN. (Insert forehead-slap here.) When I figured this out I was hopping mad for about ten minutes, but I didn't have enough time OR fabric for a do-over, so then I just laughed. It's funnier this way, and of course, from MY perspective (that of the WEARER), looking down at the dress, it's right-side-up! So that's how I'm going to think about it, anyway. It's a (Simplicity 3875), which I think of more as a summer-type dress, but I'm just going to wear it with a black tee underneath it and tights and just hope it's not as cold as the weatherfolk say it's supposed to be. I'll be inside, solving (or, in my case, often NOT-solving) puzzles most of the day anyway. I found this last stash of Michael Miller crossword fabric at Britex months and months ago — for next year's dress I think I'm going to get some custom fabric made up at . Probably an easy NYT Monday puzzle solved in red ink and tiled to fill the yardage, or maybe even as a scatter print. What do y'all think? Oh, and tomorrow — check out my last column filling in for Jan Freeman in the Boston Globe; I'm writing about my inadvertent coining of the word "Duro" (and how cool you all were to use it, making it "real"). Janine over at proposed a giveaway, and since it involved 1) really pretty slips and 2) no actual work on my part, I agreed. Here's the deal: in order to win one of their lovely slips with fancy hems, go to the and leave a comment on today's post (the one about THIS CONTEST). That's it. They'll pick a winner at random. I am always looking for new slips. (When I manage to go shopping in an actual store, I usually look for knee socks, tights, slips, colored leather gloves, cardigan sweaters, and penny loafers, not necessarily in that order.) I made some myself last year that I wore to death, and after that I bought some slippery nylon ones at Kohl's six months ago that are okay, but not great. (For some reason, mid-range department stores are the only places I can find slips these days. They're not at the low end [Target] or at the high [Saks, Lord&Taylor, Neiman's] — at least, not at prices I think are reasonable. And I'm not talking about those human sausage casings they call "shapewear," either.) The Vintage Hem slips seem reasonably priced for decorative slips — they run about $30. When is a Problem Not a Problem? When It's An Opportunity. I tore a ligament in my ankle a few months ago and have been sporting white, ever-so-lovely athletic tape on a daily basis since. This hasn't been an issue during winter, the season for multiple layers of opaque tights, but the season for wearing dresses and skirts without attracting weird looks is coming up soon. Not only that, but I have a few occasions coming up very quickly where I need to wear a dress in slightly fancier circumstances (where neither heavy winter tights nor knee-high boots, my winter solutions, are appropriate). On a daily basis, I have white tape reaching in a semi-spiral half-way up my shin. It wouldn't be as much of an issue, but I'm a 23-year-old student and have to worry about things like making good impressions at job interviews and as I try to get into grad school. Unfortunately, just leaving the tape off isn't one of the available solutions! And, as I mentioned before, there are occasions where I will be expected to wear skirts or dresses. Do you or your readers have any suggestions about how best to rise to the challenge? I let this sit in my inbox for a while because I didn't know how to answer it. It's not that I didn't have any suggestions for covering the tape; it's that I didn't have good suggestions for getting Melissa to stop WANTING to cover the tape, and I think that's the real problem. It's totally natural to want to hide anything that might stand out, or call unwanted attention to yourself, or that seems like a flaw. However … NOT covering things up is, long-term, the better solution. However, any kind of difference gives you the opportunity to learn how to deal graciously with weird looks and clueless people, and THAT is a life skill whose importance cannot be overestimated. And luckily for Melissa, her White Tape of Difference is purely temporary — she doesn't face the grinding prospect of a lifetime of people asking "How'd you do THAT?" or saying "Wow, that looks like it hurt," and so on. So you practice your "Oh, thanks for asking!" response (the one that doesn't actually answer anyone's question) and remind yourself that just because someone asks you a question, You Don't Actually Owe Anyone An Answer. It also helps you realize that Really, Honestly, Nobody is Looking That Hard. When you go out of the house with white tape, or a honking big zit, or a birthmark, or so on, you soon realize that for every person giving you the double-take look, there are four, or five, or ten who casually glance your way and never think of you again. Ever. So, my advice to Melissa is not to worry about how the taped ankle looks. It looks fine. (Remember, , either.) And if I were interviewing someone for a job (something I've done a fair bit of) or grad school (something I've never done), I'd be perfectly fine with it, and I'd probably give extra points to someone who dealt with it in a natural and matter-of-fact way, instead of apologizing for it: e.g., "I recently injured my ankle (or use a cane, or have a service animal, or whatever); are there elevators at the interview site? Could you please arrange for me to have extra time between interviews? Thank you for your consideration in this matter." So, this may not be the answer you wanted, Melissa, but it's the only one I've got. Good luck! Eh … What's Up, Doc? — is having a "Pre-Spring Cleaning Sale (but it's really a "I've got too many boxes of unlisted patterns sale")" and is offering 20% off plus the usual multiple purchase discounts on shipping, plus free shipping if you purchase three patterns. It's been a busy week, and I'm unclear as to which day of it we have attained. But my sources say it's Friday, which means that Wendy of is having a sale today, Saturday & Sunday. She'll be offering a 15% discount in place of the usual 10%. Use the code Voguesale. At Pattern Stash, shipping is just a flat $2.50 for all your patterns, no matter how many patterns you purchase (in the US only, sorry)! And at her new shop all the patterns are new and uncut, and shipping is free. That's her pattern there, that really 1960s bridal gown. I love that skirt and the short sleeves; not so sure about the chokey collars on the attendants' dresses. I know I keep harping on and on about how tired I am of winter, but one of the reasons for said fatigue is that I have been wearing basically the EXACT SAME THING for several months: a circle skirt (with a waistband), tights, t-shirt, and cardigan sweater. This is fine, mostly: it's comfortable, you can have lots of fun with skirt prints and bright tights, it's warm and layerable, and so and so forth. BUT I AM TIRED OF SKIRTS AND WANT TO WEAR SOME DRESSES PLS OK? I have a few dresses that are good for winter, nice wool, corduroy, heavy cotton and so on, but my favorite kind of dress is in a nice light cotton, preferably in a conversation print. Something with short sleeves, and a little collar, and which does not require any more accessorizing than finding a pair of shoes. So. I NEED this. I've started a search for it, and with any luck (and/or bribery, if you have a copy of this one you don't need) someday I WILL MAKE THIS. YES. I WILL. Also — I'm a little worried about the expressions on the faces of the women in this picture. I think that Blue-Stripe Woman has just announced her intention of going over and slapping the bedickens out of someone, and White-Dress Woman is both worried about the emergent crazy of Blue-Stripe Woman and really, really hoping that the slapping will actually happen. Well, two in a row make a set, yes? 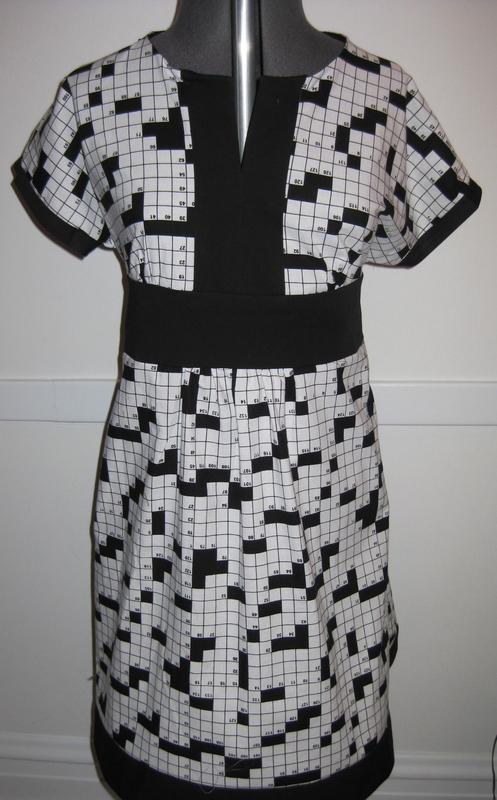 Check out this atomic-print dress that's up on eBay right now (from seller ).